A patent is a legal right provided by government to an inventor for limited period of time. It is a form of intellectual property and you can prevent other to use your inventions without your permission. With the help of Patentability search it would be easier to patent your idea. The States of Maharashtra, Gujarat, Madhya Pradesh, Goa and Chhattisgarh and the Union Territories of Daman and Diu & Dadra and Nagar Haveli. The States of Haryana, Himachal Pradesh, Jammu and Kashmir, Punjab, Rajasthan, Uttar Pradesh, Uttaranchal, Delhi and the Union Territory of Chandigarh. A provisional application is a priority application, which is filed when the invention is not finalized and is still under experimentation. A provisional application includes a specification, i.e. a description, and drawing(s) of an invention (drawings are required where necessary for the understanding of the subject matter sought to be patented), but does not require formal patent claims, inventors' oaths or declarations, or any information disclosure statement (IDS). A provisional specification is usually filed to establish priority of the invention or filing date of the invention. Complete specification is the document where all the details of the invention for which patent protection is desired are disclosed. It is filed within twelve months from the date of filing of provisional specification or priority document. A PCT application is an international application governed by the Patent Cooperation Treaty, and can be validated in upto 142 countries. A single international patent application can be filed in order to seek protection for an invention in upto 142 countries throughout the world. 1) The priority date obtained by filing a PCT application is internationally recognized, and has an effect in each of the countries designated. 2) It gives the application 30/31 months from the international filing date or the priority date, to enter into various countries, and therefore gives the applicant more time to assess the viability of the invention. 4) Provides an International Search Report citing prior art, which gives an indication to the applicant whether the invention is novel and innovative. 5) Provides an option for requesting an International Preliminary Examination Report, the report containing an opinion on the patentability of the invention. 6) The International Search Report and International Preliminary Examination Report, allows the applicant to make more informed choices early in the patent process, and to amend the application to avoid any conflicting material before the major expenses of the national phase begin. It also gives the applicant a fair idea on the patentability of the invention before incurring charges for filing and prosecuting the application in each country. Sec 2(l) - "new invention" means any invention or technology that has not been anticipated by publication in any document or used in the country or elsewhere in the world before the date of filing of patent application with complete specification, i.e. the subject matter has not fallen in public domain or that it does not form part of the state of the art. 8) any process for the medicinal, surgical, curative, prophylactic [diagnostic, therapeutic] or other treatment of human beings or any process for a similar treatment of animals to render them free of disease or to increase their economic value or that of their products. 15) an invention which in effect, is traditional knowledge or which is an aggregation or duplication of known properties of traditionally known component or components. 8. Requisite Statutory fees (cheque/DD). A patent application will be published automatically in the official journal after expiry of 18 months from date of filing or date of priority of the application containing title, abstract, application no. and name of applicant[s] and inventor[s]. Application is kept secret for a period of 18 months from the date of filing. In 19th month, the application is published in the official journal – this journal is made available on the website weekly. 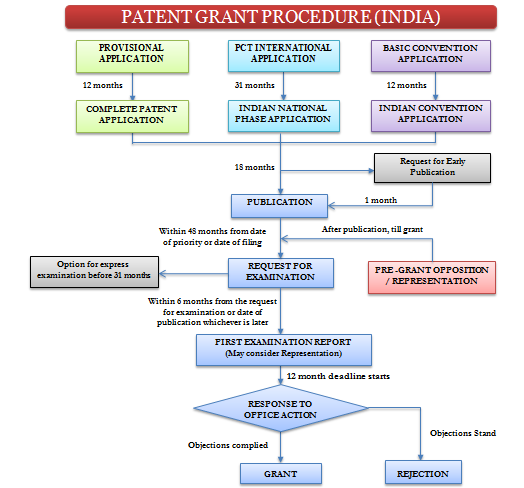 To expedite the process of grant of patent, a request for publication under Section 11(A)(2) can be made in Form 9, any time after filing of the application. Upon such request, the application will be published in one month from the date of such request. Upon publication, but before the grant of patent, any person based on grounds as mentioned in Section 25 (1), any person may file a pre grant opposition against the grant of patent. However, the opposition will be taken by the patent office only after the filing of Request for Examination. Opportunity of hearing the opponent is also available. After examining the opposition and the submissions made during the hearing, controller may either reject the opposition or accept the opposition and modify/reject the patent application. Request for examination can be made either by the applicant or by a third party. A request for examination can be filed within a period of 48 months from the earliest priority date. The controller will issue a first examination report that triggers a period of 12 Months from the date of issue of the FER to get the grant of the patent application. It is the duty of the applicant to overcome all objections raised in the FER and get the patent granted. Patent granted is published in the official journal. Within one year after the grant of a patent any interested person, based on grounds mentioned in Section 25 (2), may file a post grant opposition in Form 7 to the controller to cancel the grant of patent. To keep a patent in force, the renewal fees shall be payable at the expiration of the second year from the date of the patent or of any succeeding year and the same shall be remitted to the patent office before the expiration of the second or the succeeding year. Disclaimer: The information provided in this article is for general informational and educational purposes only and does not constitute or purport to render legal advice or legal opinions. The material is intended but not guaranteed to be up-to-date and should in no way be taken as an indication of future law and practice. Should you file your patent or not?